The Plant Variety Protection and Seed Act designates particularly important kinds of plants as 'designated seeds and seedlings' and obligates the trader to attach the label that tells prescribed items to those for sale. The Act also prescribes the criteria to be met regarding production, handling, etc. of designated vegetable seeds.NCSS implements label examinations and seed quality testing, provides guidance to seed producers and traders for ensuring appropriate distribution of seeds and seedlings, and issues seed quality certificates.NCSS is also concerned in official control of GM seed and seedling distribution. Label examination and quality test of seed (germination, variety purity, seed health, GM seed, etc.). 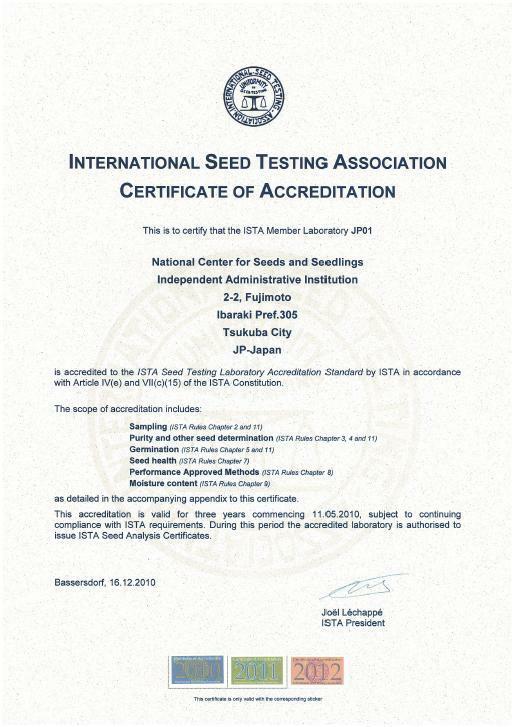 Quality testing (germination, purity, moisture, seed health, other seeds) and issue of International seed Analysis certificates.Measurement of radioactivity of seed and issue of test report. Inspection of records the production of seed and examination of variety purity. Needs for seed health test and GM seed analysis are increasing under such circumstances that seed distribution is more internationalized.NCSS is an accredited member laboratory of International Seed Testing Association, implements seed test based on International Seed Testing Rules and issues certificates. NCSS also participates in the OECD Seed Scheme.